I don’t know why this book sold so well in America. It’s not like we have a shortage of grammarian authors—we have Grammar Girl! And it’s not like the author even professes to be a grammarian (she was kidding about not knowing what a subordinate clause was, right?). From reading this book, I believe the author had a personal vendetta against all misplaced apostrophes. So, she set off to Oxford Library and wrote a book about it. Get this: she wrote over 200 pages about punctuation. That’s it. No nouns, verbs, or even interjections. Just commas, apostrophes, and dashes. When you write over 200 pages about punctuation, guess what happens? You begin to sound contradictory and preachy. I’m willing to bet most of the Americans bought this book because of the cute story about pandas shooting one another. Then they never finished reading it (a 35 page introduction is a little obnoxious). Or, if they did read it, they stared at Amazon’s page in consternation, too afraid to leave a review. You have to have some serious balls (male or female) to write a book about grammar. And, people that leave reviews for grammar books need some serious kahunas as well—“look at me, I learns grammar good”. People judge. But I’m the type of guy that is willing to walk into a conference of grammarites and yell, “wazzup, catz!” You have to live a little. That’s what the author missed: you have to live a little. Most grammar books I read talk about the differences of opinion. Newspapers and Book Publishers have their own style guides (AP Style Guide and Chicago Manual of Style, among others) and they differ. They’ll say “the ‘80s”, “the 80’s”, or “the eighties”, and they’re all correct. But not according to the author. It’s either her way, or else. And that’s wrong. English is a living language and should be enjoyed by all who strive to learn it. So let’s put away our wrist-slapping rulers and get along, okay? For some interesting, yet twisted fun, read Louis Menand’s critique of ‘Eats, Shoots & Leaves’ in ‘The New Yorker’. He points out some debatable errors found in this book on punctuation. But that’s just fighting meanie with meanie, isn’t it? 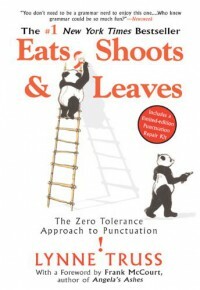 I’m giving this book a few stars for getting Americans to read about grammar and punctuation (yay! 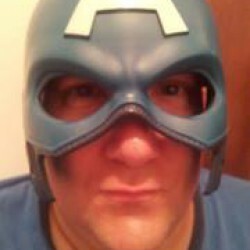 ), but taking many stars away for scaring the em-dashes out of them (boo! ).